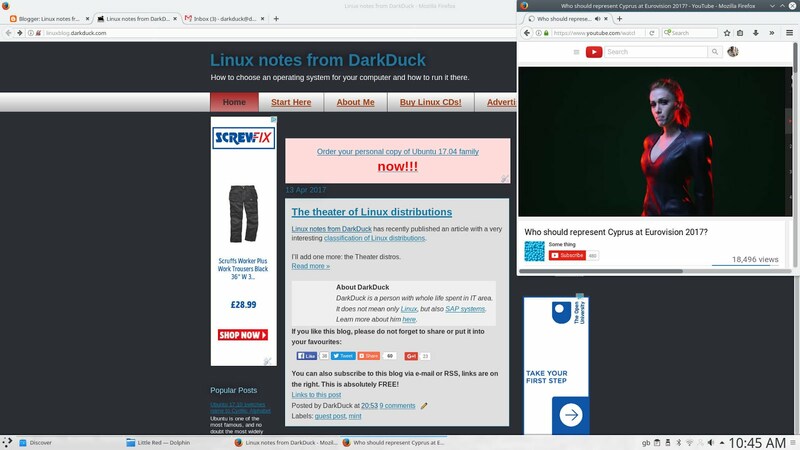 As usual, every April and October are the months when many people in the Linux community wait for the new releases of their favourite operating systems. Canonical released the newest version of the Ubuntu family of distributions on the 13th of April, and there is a good reason to look into them now. I will start with Kubuntu 17.04 for several reasons. First of all, my new laptop runs Kubuntu 16.04, and I was interested in seeing if the new version is any different from the user point of view. Second, I received a number of orders for disks with this distribution from my customers. Third, I am more than sure that Ubuntu itself will receive too many reviews without my involvement, let's focus on something more niche. I downloaded the ISO image of Kubuntu 17.04 32-bit from the torrent. The DVD disk with this image is ready to be sent to the customer, but first let's check what is in it for us. 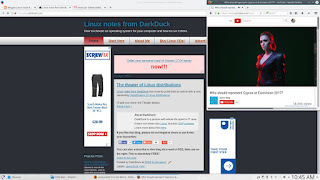 I was a bit nervous at that time, because this was the first review written when running the Live Linux operating system on my new laptop Dell Inspirion 17 5749. Nevertheless... Reboot. Choose to boot from DVD. Fasten your belts! Let's go! The boot process of Kubuntu 17.04 is the same as for many other members of the Ubuntu family. The only exception I am aware of is Lubuntu. There are no questions to the user along the boot process until you have a decision between the Live run and Install. I selected the Live Run to continue. The only difference from previous releases of Kubuntu appears only after that choice. You no longer see the KDE logo in the middle of the splash screen. It has been replaced with something different - apparently a Plasma logo with three dots and a "more than" sign. 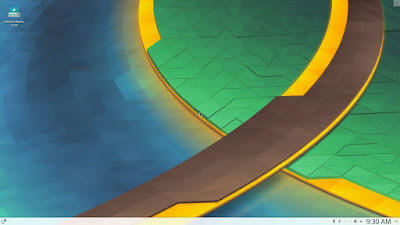 The KDE logo is still present on the screen, tucked in the bottom-right corner. The same three-dots logo appears on the menu button of the desktop when the boot sequence is complete. Once booted, you have a screen with only one icon on it - Install Kubuntu 17.04. The default wallpaper is an abstract image in green-blue-yellow-grey colours. There are no other images coming with the distribution, so you need to get your own, or use the "picture of the day" option, which will download images of pre-defined categories from online resources. There is a panel at the bottom of the screen. The menu button that I have already mentioned is on the left. The right part of the panel is taken by a notification area with usual suspects: clocks, volume, network, battery, bluetooth and USB indicators, printers and instant messaging applets, clipboard monitor, and some more. There are no quick shortcuts, virtual desktop switch or "show desktop" button anywhere on the panel. The virtual desktop and the "show desktop" widgets are available through the panel configuration. Creation of a quick shortcut is a simple task - just right-click on the button of the active application, and select "Pin". It is a bit different from Kubuntu 16.04, where the same option is called with a longer name “Show a Launcher When Not Running”. The important difference of this release of Kubuntu and KDE / Plasma is that you can now call the menu with the Super (Windows) button on your keyboard. Freshly-booted Kubuntu 17.04 takes a very decent 360-370 Mb of memory. For those looking for technical details, Kubuntu 17.04 runs on Linux kernel 4.10.0 and KDE framework 5.31.0. Kubuntu 17.04 had no issues with recognition and configuration of the Intel 3160 wireless network card available in my laptop. Click on the network indicator on the panel, select my home wireless network, and then type in the security password (twice!). That's all I had to do to get my laptop connected to the Internet. Dolphin is the default file manager in Kubuntu 17.04. It has an option to "Add network folder", although here you have the same issue as in Fedora 25 KDE. Once you click that item in the file manager, you have a choice between "Open" and "Execute". The "Execute" function is what you need, because the “Open” option gives you the editing screen with the technical details of the application. The function itself works fine and it mounts the remote network drive. Although, my experience shows that the partition mounted that way does not work particularly well. For example, there are problems with saving files from LibreOffice to that drive. Also, Firefox does not see that Dophin-mounted folder in the interface for file attachments in Gmail; even drag&drop is not working in Gmail. Therefore, I am still using the fstab mounting in my own installed system. Kubuntu 17.04 uses the English US keyboard layout by default. If you don't like it or want to add more, please use the guide that I created some time ago. It is still valid in this version of KDE / Plasma. Kubuntu 17.04 comes with a decent choice of applications ready out of the box. Firefox 52.0.1 is the default and the only browser. Other Internet tools include KMail, Ktorrent, Akgregator, KRDC and many other KDE-specific applications. LibreOffice 5.3.1.2 is the core of the Office part of the menu. In includes the Math and Base components. Other parts of the Office menu section include KMail, KOrganiser, KAddressBook and several other tools from the KDE arsenal. Amarok, K3B and DragonPlayer are the only components of the Multimedia part of the menu. Not much, and I would prefer VLC myself. Is this a workable set of applications? We’ll see later. Okular document viewer, Skanlite scanning utility, ImageMagick simple editor and GwenViewer image viewer are in the Graphics section of the menu. I tried to use Skanlite in my Kubuntu 16.04 some time ago, but quickly replaced it with SimpleScan. Of course, there are plenty of system tools and utilities: Kate text editor, Konsole, KDE Partition Manager, KNotes are just a few names. If you want to add or remove an application, then Discover is the default graphical package manager in Kubuntu 17.04. To check the installation process, I tried to install VLC player. The installation went smoothly, although you cannot properly monitor the progress of the installation, unlike Synaptic or even the terminal-based apt-get tool. Amarok is the default multimedia player in Kubuntu 17.04. Unfortunately, you cannot use it straight away for playing your music because this operating system comes without necessary codecs. You need to install them separately (and there is no notification about it anywhere on the Amarok screen), or install VLC player that comes with all the necessary codecs already pre-installed. I went the second route. On the positive side, all the videos played well in Firefox, including YouTube, CNN, BBC iPlayer and 1tv.ru videos. Have you tried Kubuntu 17.04 yourself? For me, When installed on hard disk, with the option "Install third part software", MP3 and codecs works well. This is the review of Live version... That's a bit different of the installed OS, isn't it? there's also the option of using Wine and/or Virtualization.You can try and use it to any non-linux software you like.